Today we decided to have carrots with dinner. We needed only 1 carrot. Here is a pic. We had tomatoes, corn on the cob, green beans, fried okra, 1 carrot, all from the garden and grilled salmon. I pull the carrots only as I need them and leave the rest in the garden. The carrots tops are good in salad. Last edited by Gary350 on Tue Aug 11, 2009 11:48 am, edited 1 time in total. You're pasting the wrong link for your pictures to display. Now that is a carrot! What a size!!! Holy cow is right that thing is huge. 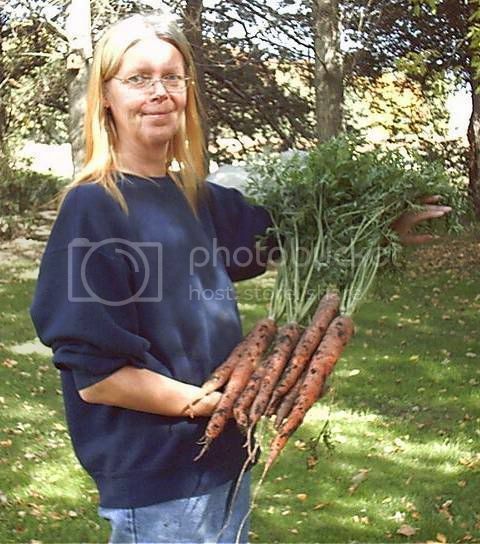 I have never grown a carrot or seen one grown near that size. My wife does the carrot raising around here, I make a 16" deep raised bed for her, last year, they went to the bottom, hit hard dirt and "Hooked" on the end...made them hard to pull, so we dug with with a fork..this variety is Healthmaster. Okay, guys, I'm seriously jealous. I blamed my rock-hard clay soil for my carrot failures, until I did the Square Foot Garden deal, and they failed there as well. How do you grow these things? David Taylor wrote: Okay, guys, I'm seriously jealous. I blamed my rock-hard clay soil for my carrot failures, until I did the Square Foot Garden deal, and they failed there as well. How do you grow these things? Not sure, but it loos like Gary and pharmer Phils wife got it on lock down. I want some big 'ol carrots. Every year there is more hope though, don't give up. Very nice carrots. I've never tried growing them. But from everything I'm reading here it seems you need soft soil. My soil is hard clay. So if I do plant carrots I'll try potting soil in a pot. When I moved here to Minnesota in 96, the garden spot that was used before I came, was a small 20x25 foot, it had dead plants from the previous gardener, they looked like they were protruding out of a sidewalk! Now, most places in the 7000+ square food garden, I can burrow my hand/arm to about a depth of 8 inches without much effort. Diane wrote: Very nice carrots. I've never tried growing them. But from everything I'm reading here it seems you need soft soil. My soil is hard clay. Carrots do need soft soil, the softer the better. I plant the half long variety because I don't want to work the soil 16" deep. I save wood ashes from my wood stove all winter and put it in the soil the following year. I usually only have about 3 to 5 gallons of ash to put in a spot 3 ft wide 20 ft long. I tilled in a lot of sand to loosen the soil. I have to till in a lot of organic material every year to keep it soft. The trick is organic material, lots and lots of very soft composted stuff. If the soil is soft enough that you can stick you hands down into the soil and scoop up a giant 1 gallon size hand full without the need of a shovel or tiller then the soil is perfect. I till in Muratic of Potash and Super Phosphate too, about 1/2 a bag of each every year, it comes in a 5 lb bag. I sprinkle the carrots seeds out in the snow in late February an when the weather gets right they come up. The seeds need a minimum of 3 weeks of cold weather or they won't sprout. I sprinkle the Denver Half long seeds like planting grass seed in a row 2 ft wide 20 ft long. In about a month of so the tiny carrot plants will be everywhere. It is a challange to keep the weeds out, I pull weeds by hand about every 3 days. In about a month the carrots will be large enough to crowd out all the grass and weeds. About June there will be carrots large enough to eat. I pull them as I need them and let the others keep growing. By August the carrots are much larger and by October they are giants. Carrots can stay in the garden all winter the snow and cold weather does not seem to hurt them. The carrot tops are great in salad and soup. The best time for me to prepare my carrot soil is in Nov or Dec a small pickup truck load of composted manure tilled in is perfect. If I can not get composted manure 2 bales of 3.8 cu ft peat moss works good. I till the compost in with the tiller 3 ft wide 20 ft long then rake it up into a hill and level it off flat on top so it is 2 ft wide about 8" deep. Gary and Phil, thanks for your secrets for growing carrots. I like the idea that you can start them when there's snow on the ground. It's such a long wait to start a garden and carrots can get me started earlier. Seconding Diane in thanking pharmerphil and Gary350.